One of summer’s greatest pleasures, and something we grow so well in Ontario (and in our backyards), is fresh tomatoes. 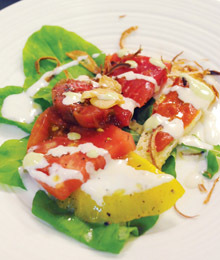 Here’s a recipe for Jamie Kennedy’s delicious tomato salad. Toronto transformed into Hollywood this past September as hundreds of celebrities filled the streets of the largest city in Canada during the 35th annual movie movement Toronto International Film Festival. For 10 star-studded days, Yorkville, King Street West and the downtown core of Toronto exploded with action as enthusiastic crowds gathered around the legendary actors and filmmakers that revealed their latest projects. At sundown, A-list celebrities scoured the city’s hot spots to celebrate their films and mingle with fans. 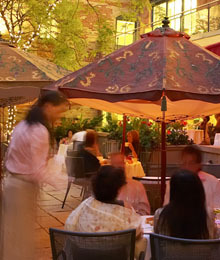 The Roosevelt Room Supper Club was a staple stop for famous film stars like Edward Norton, Robert De Niro, Hayden Christensen, David Schwimmer, Milla Jovovich and a bevy of others who were seen socializing at the sophisticated site.